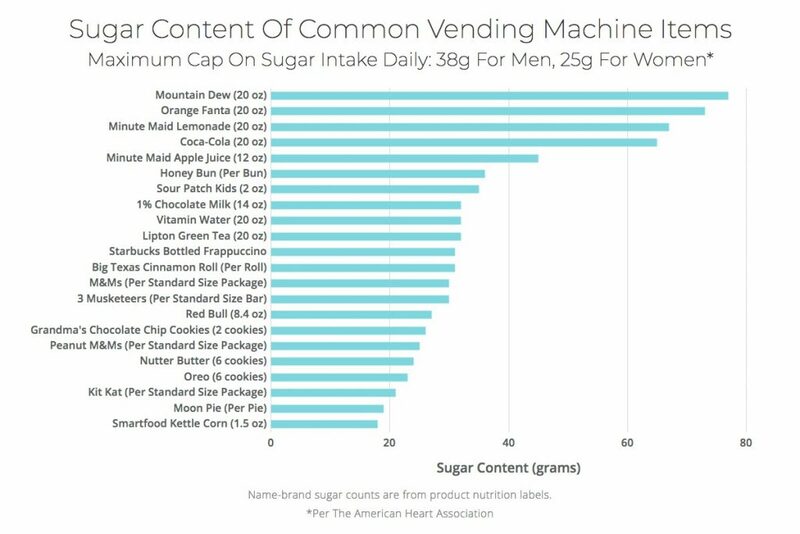 It’s estimated that 20% of hospitals have fast food restaurants on the premises, with twice that number in teaching hospitals.² Obviously, food must be available for patients, visitors and staff, but the amount of sugar-laden foods in most vending machines and cafeterias is staggering. One bottle of Mountain Dew, a popular soft drink, contains 77g of sugar. 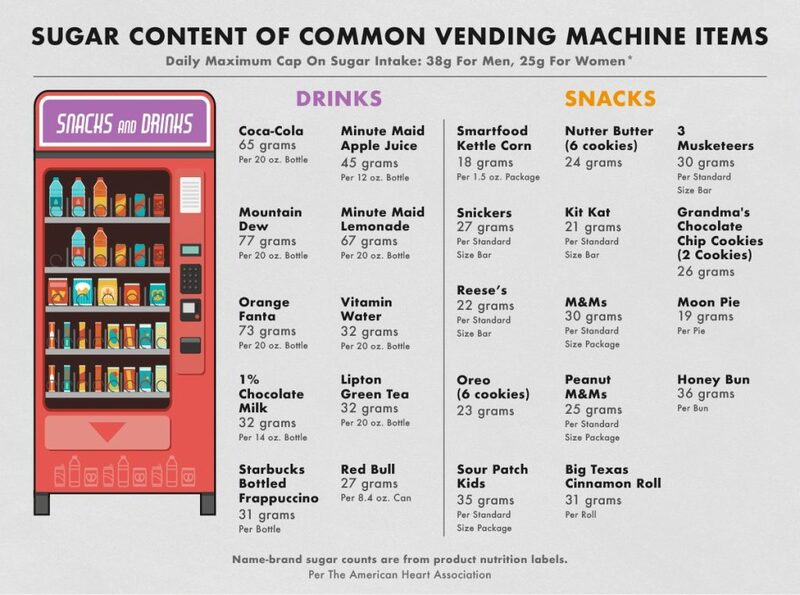 Many snacks found in vending machines, such as Reese’s Oreos, and Honey Buns, have over 20g of sugar each. Even “Smart” Water, which is fortified with extra nutrients, contains 32g of sugar–not so smart. 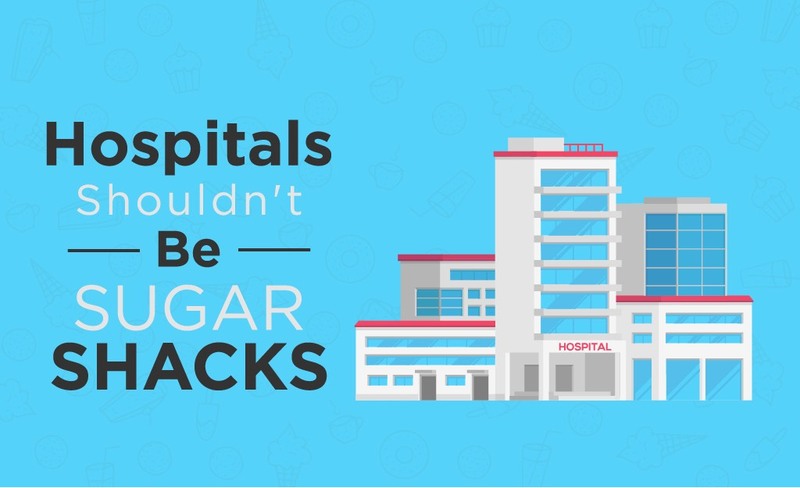 Hospitals are the place where people go to improve health, but the abundance of unhealthy foods sends a conflicting message. This is why some doctors are campaigning for change–to curtail access to unhealthy foods in hospitals. 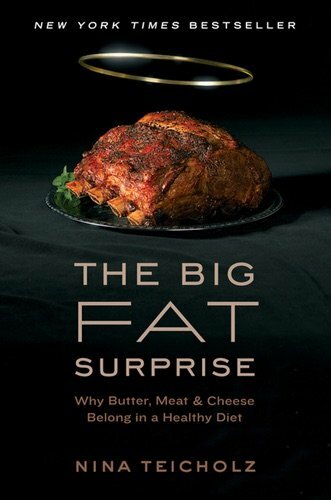 Dr. Malhotra has also written countless articles on the issue, including a notable piece for The BMJ in which he asserted that “an oversupply of nutritionally poor and energy dense foods loaded with sugar, salt, and trans fats—fueled by the junk food industry’s aggressive and irresponsible marketing—has even been allowed to hijack the very institutions that are supposed to set an example: our hospitals.”⁴ Dr. Malhotra co-founded Action on Sugar, a U.K.-based nonprofit that aims to educate people about the dangers of sugar and how to reduce its consumption. Meanwhile, in the U.S., Dr. Mark Cucuzzella, a family physician at the Jefferson Medical Center (JMC) in West Virginia and a professor at the West Virginia University School of Medicine, saw a huge disconnect between the diet advice he was giving to patients and the food available to them at his hospital. In an op-ed published in Salon, Dr. Cucuzzella describes the scenario of a surgery patient who is asked to avoid solids and drink only clear liquids. Following this advice, the patient consumes such drinks as Sprite, with over 30g of sugar. Post surgery, the patient is then given a protein shake that has four times the daily recommended amount of sugar. Dr. Cucuzzella launched the “The “Sugar-Free JMC” initiative at his hospital to remove sugar from the cafeteria, vending machines, and patient trays. This initiative led to the staff altogether losing hundreds of pounds. Along with U. Penn, other hospital systems around the country, such as Seattle’s Children’s Hospitals and St. Luke’s Hospital and Clinic in Duluth, MN, are starting to limit patient access to sugary drinks and foods.⁷ The movement appears to be spreading. One could argue that hospitals shouldn’t play food police to the public, but they’re already dispensing drugs and devices to improve health. Thus, for nutrition-related diseases, wouldn’t healthier food be the best medicine? Do low-carb diets shorten life? I’ve also said the same thing. The food being served in these hospitals is so unhealthy. All processed meals. Have you ever read the back of that bottle of boost that they’re serving the elderly people? Even those with diabetes. It’s supposed to be good for them is what we’re told. Liquid medicines are full of high fructose corn syrup. Even the ones you buy off-the-shelf. Diet pop is served to diabetics. Sure let’s give them a dose of chemicals. Got to help them heal nicely. Read the back of the Jell-O’s and the pudding cups that they bring to your hospital bed for lunch. Personally I don’t know how anybody can eat it. All I can taste are chemicals. I used to bring homemade food to my mom or dad when they were in the hospital so they wouldn’t eat that hospital stuff. When it was my turn to be in the hospital I never ordered any food from the hospital food menu. My kids brought food from home to me.